I think some of these post titles are going to basically become mini novels - hopefully people are okay with that. 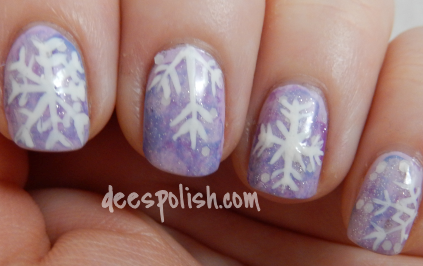 I figured why not kick off this rad countdown series with one of my personal favourite nail art creations of the holiday season.. plus, its name plays homage to one of my top films Forgetting Sarah Marshall. Paul Rudd, my future brother-in-law, thank you for being you. I first debuted this look in 2012 - you can see it HERE - then I did it again last year - seen HERE - and I did it again now. BUT. I changed it up ever so slightly. 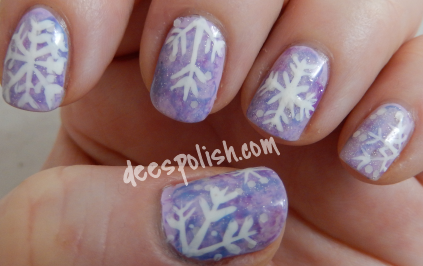 I already have a look that I am recreating that is a gradient, so I figured why not use the colours in the saran wrap method? Did and done. I love it! Blot with a mushed up piece of saran wrap, and keep blotting until you are happy with the result - side note: sometimes you might need (want?) to add more polish and try again. It happens. 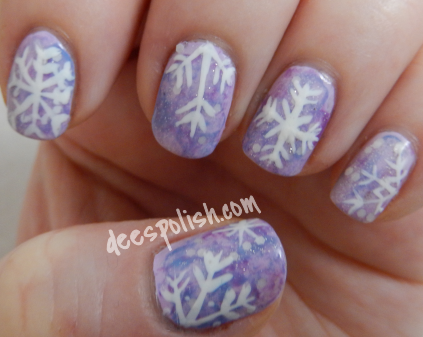 Paint on the snowflakes - there are many, many tutorials all over the web, or just paint on whatever you'd like - your nails, have fun! See? Not too terribly difficult to do. Could you imagine this kind of look with blues? Or the classic green and red for Christmas? Endless possibilities!